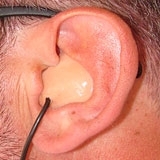 custom molded stereo earbuds to one ear. Keep one ear open and have true stereo (both channels) mixed to one ear. 3 standard wire lengths available. for custom length, make note on order box. Gold plated 3.5'' (1/8") stereo plug.